New Jersey’s Skate And Surf Fest 2015 lineup consists of an entertaining array of local, national and international punk rock bands including several from the New England area. 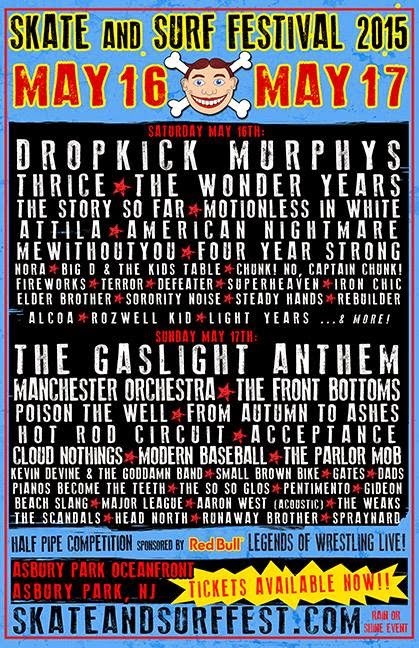 This year, the multi-day event at Asbury Park Oceanfront will host headliners, The Dropkick Murphys (Born & Bred Records), as well as Big D and the Kids Table (Strictly Rude Records), Defeater (Epitaph/Bridge Nine), Rebuilder (Panic State) and Connecticut’s Sorority Noise (Top Shelf). Skate And Surf spans May 16th and May 17th and features live music, events and a half pipe competition sponsored by Red Bull. Skate And Surf is produced by GameChangerWorld & powered by GameLoud. View additional information including full lineup, ticket and hotel information here. Skate and Surf started in 2001 and over the following decade grew into The Bamboozle Festival. Now back for the third year after an 8-year hiatus, the festival truly returns to its roots and traditions with this year’s line-up and venue! Follow the event on Facebook and Twitter for announcements.